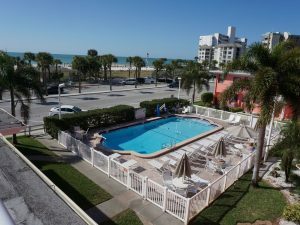 A 2 bedroom 1 bath condo on the third floor overlooking the Gulf of Mexico. A newly remodeled bathroom with a large walk in shower. A queen bed in the master bedroom and two twins in the second bedroom. New flooring ion the bedrooms. Televisions in the master bedroom and living room. Wi -Fi is provided by the condo association. Views from the living room and mater bedroom of the water and pool. Guest can bring an air mattress or with notice a roll a way bed can be supplied for a fee. All linens are provided as well as kitchen essentials, pots, pans, dishes, microwave, coffee maker, silverware. There is a laundry facility on the property.